This professional training briefly reviews the latest cutting-edge power therapies EFT and TAT, and then goes into in Whole-Hearted Healing (WHH) technique. This is a regression technique that uses and understanding of the triune brain structure of the mind to heal trauma and trauma-based physical and emotional problems. We'll cover the significance of the out-of-body experience to trauma, and explain how to know when traumas are fully healed. We also cover the biological basis for trauma - there are reasons why some events are traumatic for one client and not for another. We'll also cover prenatal, sperm, egg, and precellular events in detail, and how they are of key relevance to healing and peak states. This course is designed for therapists who are seeing clients. Laypeople are welcome (with instructor permission) if they have enough experience with trauma therapies. In all cases, we will ask the potential students to have a session with a therapist who uses this technique, to find out if they can benefit from the technique. What is the Whole-Hearted Healing™ regression technique? This is a dramatically effective, simple, and rapid technique for healing trauma. In essence, this technique applies to any issue in our lives where we don’t have a feeling of calm, peace, and lightness. A typical issue takes about 30 minutes to heal. This is a regression technique which does not require any special preparation (such as hypnosis). WHH can be used on its own or in conjunction with other healing or transformational techniques like breathwork, EFT, or TFT. 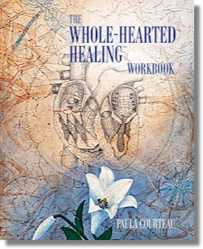 See Questions and Answers on Whole-Hearted Healing for more information. It is ideal for doing prenatal regression for healing, and for research into treatments for subcellular disorders. What you can expect to gain by taking this course? You can expect to heal several personal issues for practice during the training, as well as get practice assisting others. The course is particularly valuable for therapists searching for new ways to help their difficult to cure clients. Emphasis is placed on learning and becoming comfortable with what can occur using very powerful therapies. This course is also suitable for laypeople who want to learn how to heal themselves effectively. This single course is all that is necessary to master the basic technique. You will learn how to use it to increase the speed, power, and effectiveness of other ‘energy’ therapies like EFT. You will also learn the Distant Personality Release (DPR) technique for reducing client resistance to healing and for releasing co-dependent patterns by detaching unwanted emotional connections between people. This greatly improves the effectiveness of the basic Whole-Hearted Healing™ (WHH) technique. This course is a prerequisite for our PeakStates Therapist training; and it can be helpful for therapists who are learning our major disease techniques (schizophrenia, addictions, autism, etc.). Try and bring at least three personal issues that you would like to heal. We advise that you plan on taking time out during the workshop and not schedule other activities (including emails or phone calls), so that you can be free of distractions . We recommend that you be familiar with Emotional Freedom Technique (EFT), Thought Field Therapy (TFT), or similar meridian therapies. Please bring a notebook for experiential journal entries. Therapist background; or willingness to get relevant training. 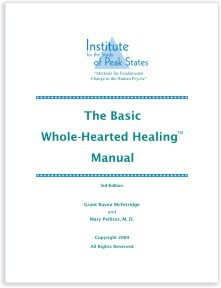 The Basic Whole-Hearted Healing Manual (3rd Edition 2004), by Grant McFetridge and Mary Pellicer, MD. The EFT Manual by Gary Craig. This is a free, downloadable manual from the EFT website. You Can Heal Now: The TAT Workbook by Tapas Flemming. This free, downloadable manual explains the very useful TAT process for allergies and trauma. Traumatic Incident Reduction by Gerald French and Chrys Harris. An excellent reference on this regression power therapy. At the Speed of Life by Gay and Kathleen Hendricks. Explains their body-centered therapy approach. The Learning to Love Yourself Workbook by Gay Hendricks. Useful for the Whole-Hearted Healing regression steps. Focusing by Eugene Gendlin. Helpful for understanding the 'phrase' or belief found in the WHH process. A Child is Born, by Lennart Nilsson. Excellent photographs of early sperm, egg, and fetal development which is seen during WHH regressions. Traumatic Incident Reduction (TIR) therapist training is highly recommended for the listening skills they teach (as well as their trauma technique). 1.3, Nov 20 2009: Changed the course number from 110 to 111. Put course 110 into the obsolete course list. Revised the course outline to remove triune brain and peak states items. 1.2 July 7, 2009: Revised course length from 4 to 7 days. 1.1 January 20, 2007: First description of this course.